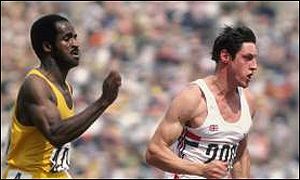 USA's Jim Hines - First Human To Run 100 Meters At 9.9 Seconds! Jim Hines of the USA becomes the 1st human being to run the 100 meters under 10.0. Here he sets the world record at 9.9 seconds in the spring of 1968! 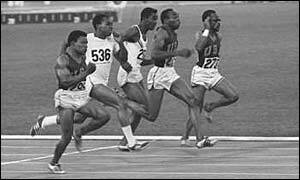 Picture of Jim Hines sets the world recond at 9.9 seconds in the 100 meters in the spring of 1968. Armin Hary of West Germany - First Human To Run 100 Meters In 10.00 Seconds Flat! Armin Hary of West Germany sets the world record in the 100 meters at Zurich, Switzerland in 1960. He was the first human being to run the 100 meters in 10.0 flat! Hary has the fastest start ever record in any sport, even to this day - 00.08 seconds!!! "Der historische Lauf" Weltrekord über 100 Meter in 10,0 Sekunden, am 21.06.1960 in Zürich Mehr nter." Armin Hary setting the world record at the 100 meters in 10.0 flat!!! Armin Hary winning the men's 100 meters at the 1960 Rome Olympics. USA's Jesse Owen: 1936 Olympics 100 Meters Mens Finals - 1st Olympic TV Broadcast! At the 1936 Berlin, Germany Olympic Games, Jesse Owen wins the 100 meters mens final in the first commercial television broadcast of any significant size. There were only a few thousand early TV sets sold in Germany and England in 1936 (non in the US or anywhere else). This broadcast was 3 years before the first TV images shown to an American public at the New York World's Fair in 1939. Jesse Owen won the race with an incredible time for the era of 10.3 seconds! Considering the era, the track, and the sports technology at the time, Owen's winning mark was just shy of his world-record of 10.2 set earlier in 1936. Adolf Hitler was in the stands to watch this history sports event. Pictures of Jesse Owen's history feat at the Berlin, Germany Summer Olympic Games. He won 4 gold medals in the sprint and jumping events for track & field! Olympic Champion Jesse Owen - Fastest human in the 1st half of the 20th century!! !